This album was my first exposure to Marillion, and the first thoughts that I had were that they sounded a lot like Genesis, and the real Genesis, not the pop stuff that the band was putting out by that time. The album truly grew on me, and with time I came to realize that it might have some leanings towards Genesis (certainly Fish' vocals feel a lot like Peter Gabriel at times) but this is really worlds beyond Genesis. Indeed this CD is a masterpiece, and probably my second favorite album of all time (Queensryche's Operation Mindcrime taking the number one spot). As much as I love classic Genesis, they have never produced an album that is this consistent. There is not a single note out of place on this one. I can't imagine the band improving the disc by changing even one thing. The lyrics are impeccable and the story is a universal one, if a bit unclear. The listener will certainly be able to relate to sections of the lyrics here, even if they can't figure out the whole picture and how it all fits together. 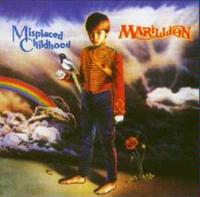 If you only buy one Marillion album, make it Misplaced Childhood. This is one of the finest discs ever created. Beautiful keyboards serve as the backdrop for what is a half spoken, half sung poetry recital by Fish. Steve Rothery also adds some awesome guitar work in the background of this one. This one sets the stage lyrically for the emotional play that is about to begin. "The spirit of a misplaced childhood is rising, To speak his mind, To this orphan of heartbreak, disillusioned and scorned, A refugee, refugee" This one merges directly into the next cut. This one was actually a huge hit for the band, and the first introduction many had to the group. If you are like me when you hear the words single and hit together, you think of asinine pop music. Well, this one is one of the exceptions to the rule. This is a very well constructed and potent progressive rock ballad. Rothery again finds the opportunity here to put in a very tasty solo, and Fish's lyrics are incredibly strong here, painting very solid pictures for the listener, and I think any man can relate to the feeling of regret at lost love here. "Do you remember, The cherry blossom in the market square? Do you remember, I thought it was confetti in our hair, By the way, didn't I break your heart?, Please excuse me, I never meant to break your heart, So sorry, I never meant to break your heart, But you broke mine" "Kayleigh, is it too late to say I'm sorry, And Kayleigh, could we get it together again, I can't go on pretending that it came to a natural end, Kayleigh, I never thought I'd miss you, And Kayleigh, I've hoped that we'd always be friends, We said our love would last forever, So how did it come to this bitter end?" "Kayleigh, I'm still trying to write that love song, Kayleigh, it's more important to me now you're gone, Maybe it will prove that we were right, Or it'll prove that I was wrong." Coming in with just piano, the opening verse is sung over this accompaniment. This one is lyrically based on a nursery rhyme, seemingly to convey the innocence of the lost love. "Then I heard the children singing, They were running through the rainbows, They were singing a song for you, Well it seemed to be a song for you, The one I wanted to write for you, for you, you" "Lavenders blue, dilly dilly, lavenders green, When I am king, dilly dilly, you will be queen, A penny for your thoughts, my dear, A penny for your thoughts, my dear, IOU for your love". The band manage to make this a pretty intensely powerful piece, and once again transition it straight into the next song. At nearly six minutes, this piece is a series of five train of thought, seemingly isolated experiences. Obviously the title, more than just clever word play on a synonym, tells the listener this - namely that this is a series of songs tied together out of a shared bitterness. The first part of the suite starts with just textural keyboards and some seemingly random drumming As it carries on some melody elements seem to emerge, but never really fully develop, and Fish essentially gives us another poetry reading to start off the suite. This piece is entitled "Brief Encounter", and I have never really grasped the meaning of it. The second segment is based in the same backdrop and is entitled "Lost Weekend", again, I am not clear on the lyrical concepts here. The only real difference here is that Fish's vocal delivery is more sung than the last segment. At the end of this movement, the band moves into a full-on prog rock jam, having ramped up the intensity steadily, but almost imperceptibly during the last section. This new jam resolves out into a guitar based song structure that is very pleasing to the ear. Entitled "Blue Angel", it obviously speaks of an encounter with a prostitute. The band hit their stride as this one resolves out, and Rothery takes a soaring solo. This drops down, then, first to piano, then picked guitar. As an insomniac writer, I can really relate to the lyrics of this one, entitled "Misplaced Rendezvous" "It's getting late, For scribbling and scratching on the paper, Something's gonna give under this pressure, And the cracks are already beginning to show". The main focus of this section, though is the aforementioned rendezvous. "This time, it seems to be another misplaced rendezvous, This time, it's looking like another misplaced rendezvous, With you, The parallel of you, you". The final segment of the suite, based on the balladic forms started in the last movement, is called "Windswept Thumb" and seems to speak of a wanderlust in the personality of the narrator (or Fish depending on how personal these lyrics really are). "On the outskirts of nowhere, On the ringroad to somewhere, On the verge of indecision, I'll always take the roundabout way, Waiting on the rain, For I was born with a habit, from a sign, The habit of a windswept thumb. And the sign of the rain." With a crescendo and a final cry of "rain", this moves into the next track. As this one begins to emerge a voice says, "Rain on me", in an obvious nod to The Who. This is a faster paced, harder edged prog rock number. This eventually drops to just atmospheric keys and vocals later in the piece, and some of the lyrics here are incredible. "And the man from the magazine, Wants another shot of you all curled up, 'Cause you look like an actor in a movie show, But you're feeling like a wino in a parking lot, How did I get here anyway?" Finally, as Fish declares, "And the man in the mirror has sad eyes", it transitions to the next piece. This is a short bouncy prog number with a dark tone. This one is quite a strong piece. This cut has a great percussion presence and the move into " Lords of the Backstage" is brilliant. Another short piece, this is a bouncy prog number that really rocks. Fish's performance is incredible here and the lyrics here are exceptional. "A love song with no validity, Pretend you never meant that much to me, Numb, a valium child. Bored by meaningless collisions, A lonely stretch of headlight, diamonds trapped in black ice, A mirror cracked along the white lines…I just wanted you to be the first one, I just wanted you to be the first one"
Coming in at a slower pace, this one builds up very dramatically. This one is an emotional powerhouse and it keeps changing and reworking itself. At over 9 minutes it can afford to. 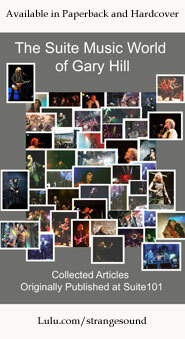 This one, like "Bitter Suite" is divided into movements. This first movement, "Vocal Under A Bloodlight" begins with the lines "Last night you said I was cold, untouchable, A lonely piece of action from another town, I just want to be free, I'm happy to be lonely, Can't you stay away?" This doesn't last much longer, and as it transitions into the next segment, "Passing Strangers" it shifts to a more balladic pattern, but still holds the basic themes from the first movement. "So now we're passing strangers at single tables, Still trying to get over, Still trying to write love songs for passing strangers, All those passing strangers". This resolves into a very powerful balladic melody as it carries forward into the next segment, "Mylo". As someone who interviews musicians, and indeed has interviewed Fish (albeit on the telephone), I found the following lines to be extremely well written and powerful. "Another Holiday Inn, another temporary home, And an interviewer threatened me with a microphone, 'Talk to me, won't you tell me your story'…And so I talked about conscience and I talked about pain, And he looked out the window and it started to rain, I thought: 'Maybe I've already gone crazy', And so I reached for a bottle and he reached for the door, And I picked up the sleeping pills crushed in the floor, Inviting me to casual obscenity". This lyrical segment gives way to an intriguing guitar solo section that calls to mind again the sound of Genesis' Steve Hackett. Rothery works through this melody, but then it goes away, replaced by a thumping rhythmic section. It's pretty obvious here that this represents a drug and alcohol induced haze. "Wasted, I've never been so wasted, I've never been this far out before" However, the experience causes him to confront the real issues haunting his spirit. "Perimeter walk, There's a presence here, I feel I could have been ancient. I could have been mystical…There's a presence, A childhood, my childhood, My childhood, childhood, a misplaced childhood" This "Perimeter Walk" segment ends with the lines, "The childhood, the childhood, Oh please, give it back to me", and then the band explode out into a very powerful hard edged progressive rock stomp, the guitar catching plenty of chances to solo as they move it into the "Threshold" segment. One of the most powerful musical elements of the album, this section also features some of the most gut wrenching lyrical imagery. "I see priests, politicians, The heroes in black plastic body-bags under nations' flags, I see children pleading with outstretched hands, Drenched in napalm, this is no Vietnam, I can't take any more, should we say goodbye, How can we justify? They call us civilized!" A reprise of earlier musical themes crescendos and transitions the piece into the next song. After all the bitterness and dark despair that pervaded much of the album, it resolves out into this gloriously potent and uplifting composition. This song is quite probably the single most empowering song every done - at least it sure has that effect on me. "And it was morning, And I found myself mourning, For a childhood that I thought had disappeared, I looked out the window, And I saw a magpie in the rainbow, the rain had gone, I'm not alone, I turned to the mirror, I saw you, the child, that once loved" The realization sinks in, "Hey you, surprised? More than surprised to find the answers to the questions. Were always in your own eyes, You realize you could have gone back to her, But that would only be retraced, In all the problems that you ever knew, So untrue, For she's got to carry on with her life, And you've got to carry on with yours". The further realization comes that "I can do anything, I'm still the child. 'Cause the only thing misplaced was direction, And I found direction, There is no Childhood's End" The fast paced prog begun in this one carries straight through into the album's closer. A quick shift to a traditional Celtic jam takes the composition and the group begin building a killer prog structure from there. This is another that rocks out rather well, while still maintaining strong prog and traditional Celtic leanings.